Mrs. Mary J. 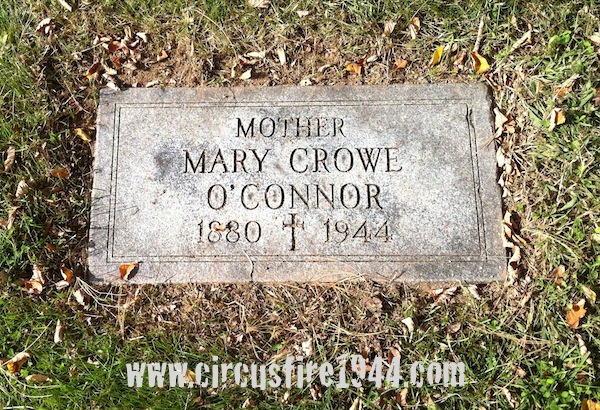 (Crowe) O'Connor of 48 Tremont Street, Hartford, was born January 29, 1880 in Hartford, daughter of Irish born parents Ellen (Whalen) and John Crowe. 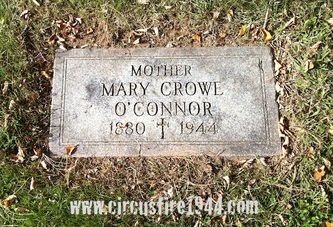 She was found dead at the circus grounds after the fire on July 6, and was buried at Mt. 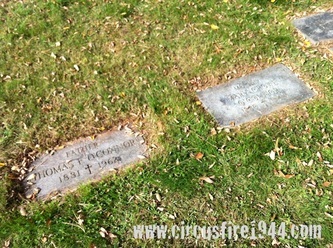 St. Benedict Cemetery in Bloomfield after services at her home. She leaves her husband, retired Hartford police officer Thomas F. O'Connor, 63; two sons, Hartford police commissioner Thomas F. O'Connor, Jr. and Hartford Fire Department Lieutenant John J. O'Connor; a brother, John Crowe of Hartford and a sister, Mrs. Walter Smith of Philadelphia. Body #2118 was identified as Mary O'Connor at the State Armory by her son on Friday, July 7. Her estate was awarded $6,500 by the arbitration board.